The sport-utility robot, built in 2927, was the first polluting robot and the first successful robot to be big and sporty. Mom decided to classify it as a light truck. The design is ancestral to most modern robots, and looks like a primative version of Bender. The name "sport-utility robot" may be a reference to 21st century SUV's (sport-utility vehicles) which pollute more than sedans. As of 3003, sport-utility robots are obsolete and generally replaced by the Robot 1-X, at least as laborer robots. 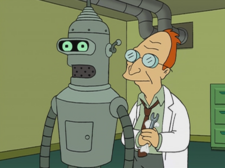 The sport-utility robot seen in the Professor's flashback was allegedly one of the original designs for Bender. This page was last edited on 17 October 2014, at 15:41.